When you stay at The Reef at Atlantis in Paradise Island, you'll be on the beach, a 3-minute drive from Cabbage Beach and 9 minutes from Paradise Island Golf Club. This 4.5-star resort is 8.3 mi (13.4 km) from Cable Beach and 2.1 mi (3.4 km) from Ocean Club Golf Course. Make yourself at home in one of the 497 air-conditioned rooms featuring kitchens with refrigerators and microwaves. Rooms have private balconies or patios. Flat-screen televisions with cable programming provide entertainment, while complimentary wireless Internet access keeps you connected. Conveniences include safes and minibars, and housekeeping is provided daily. Relax at the full-service spa, where you can enjoy massages, body treatments, and facials. Gambling sorts can try their luck at the casino, while others may prefer a nightclub or a complimentary water park. This resort also features complimentary wireless Internet access, concierge services, and babysitting/childcare (surcharge). Enjoy a meal at the restaurant or snacks in the coffee shop/café. The resort also offers 24-hour room service. Relax with your favorite drink at the bar/lounge or the poolside bar. Buffet breakfasts are available for a fee. 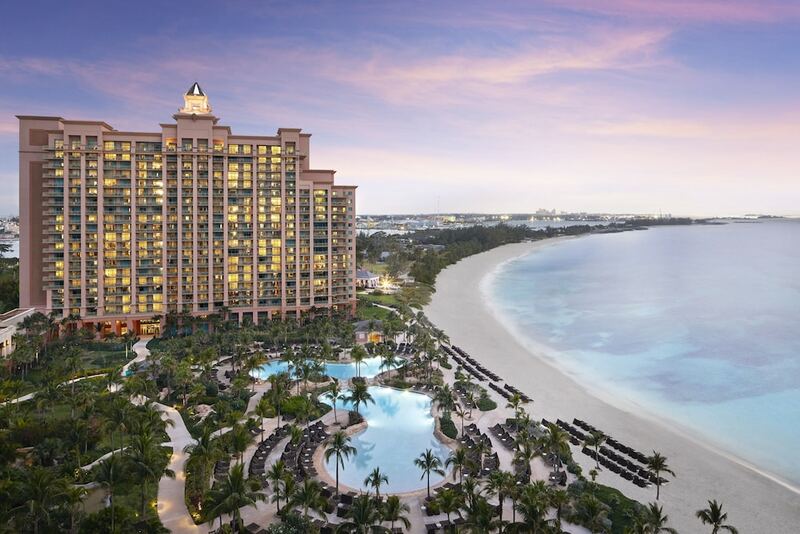 Located directly on picture-perfect Paradise Beach, The Reef at Atlantis, Autograph Collection opens to miles of white sand and crystalline sea on one side, and the excitement of Atlantis on the other. The Cascades Pool, located between the Reef and Cove resorts, is an all-ages pool exclusively for Reef and Cove guests. Guests have full access to Atlantis' attractions, activities, restaurants, bars, casino, and Mandara Spa. Supervised childcare/activities are available. Mandara Spa Atlantis brings together ancient Balinese healing touches, traditional European therapies and natural elements indigenous to The Bahamas. Taking of the Waters offers warm and cold plunge pools as well as steam and sauna rooms in both the women's and men's private lounge areas. Additionally, couples can enjoy the Couple’s Spa Suite and the women's area includes a relaxing aromatherapy room while the men can indulge in exclusive "Time for Men" barber services or watch the plasma TV in their lounge room. Other services include body scrubs, massages, body treatments and wraps, facial treatments, manicures and pedicures. Advanced reservations are required for spa treatments and massages. The Atlantis Resort offers an enticing array of dining options, from gourmet to casual snack spots, with indoor and fresh-air seating. Notable restaurants include Chef Jean-Georges Vongerichten's Café Martinique, Nobu, by celebrated Japanese chef Nobu Matsuhisa, and Fish by chef José Andrés. Smoking is not permitted in indoor public areas. Mosaic - This Mediterranean-influenced restaurant features “action cooking” stations to prepare dishes on demand, from fresh fish to churrasco steak. Designed by Jeffery Beers, Mosaic embraces natural light, which plays off the polished chrome, wenge wood, and limestone. Breakfast, dinner, and Sunday brunch. Cascades Grill - Located by Cascades Pool. Hot and cold wraps, barbecued pork, seasonal salads, jerked meats, and frozen drinks. Fish - Seafood restaurant by chef José Andrés. Café Martinique - Made famous by its 1965 appearance in the James Bond movie Thunderball, Café Martinique has been recreated by award-winning Chef Jean-Georges Vongerichten. Guests wine and dine on delicate French cuisine while enjoying direct views of the beach and ocean; some outdoor seating is available. Dinner only. Nobu - First Caribbean outpost of famed Nobu restaurant. Created by celebrity chef Nobu Matsuhisa. Cutting-edge Japanese cuisine with Bahamian influences. Sushi bar, sake cellar. Located off the Atlantis Casino. Casa D'Angelo - Top-rated, Florida-based restaurant showcasing Tuscan cuisine. Freshly made pastas, specialties prepared in wood-burning ovens, outstanding wine list, traditional Italian desserts. Café Martinique - Created by internationally acclaimed chef Jean-Georges Vongerichten. French gourmet fare in spectacular setting, including wrought-iron birdcage elevator, dramatic mahogany staircase. Located in Marina Village. Seafire - Contemporary steakhouse featuring grilled meats, fresh fish, and signature dish: Spit-Roasted Prime Rib. Mosaic flooring, high ceilings, amber-glass lighting. Located in Marina Village. Carmine's - Outpost of popular New York restaurant. Italian favorites served family style. Situated in a plaza at Marina Village, under the canopy of an enormous tree. Marina Pizzeria - Pizza to go or to enjoy on an outdoor terrace.